The StingRay 6048 Inline Dual Lift Door Parts Washer not only offers an impressive parts washer power density for parts cleaning but also the patented oscillating power wash manifold to maximize parts cleaning in any industrial application. The parts washer is designed for conveyor feed for maximum throughput in automated parts cleaning process lines such as in the cleaning of rail bearings for reconditioning and rebuild. The parts washer is designed to automatically clean a standardized pallet load of parts. Dual entrance and exit lift doors automatically open for loading and unloading of parts. Turntable roller tracks are designed to receive a standardized pallet with a basket or a fixture load of parts, the track rollers mate with feed and discharge rollers located outside cabinet. The machine locks the standard pallet loaded with parts onto the turntable for cleaning. StingRay offers various levels of automation depending on the needs of the end user. Powered entrance and exit conveyors are avilable for feed and discharge of the wash load. 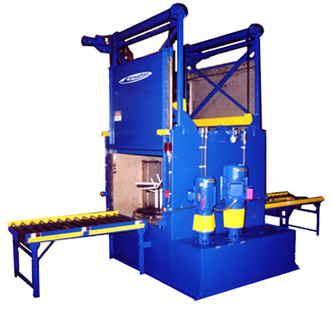 An automatic loading device that moves pallets from the entrance conveyor onto the turntable is available as an option. Full automation is available whereby pallet loads queued at the entrance conveyor are automatically processed through the excapement mechanism, cleaned and discharged without operator intervention.